What did you do this morning? Cinecultist pretended to be a legit entertainment journalist. 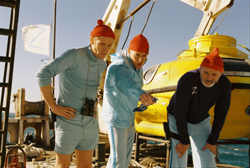 We went to the Life Aquatic with Steve Zissou press junket at the Ritz Carlton hotel in Battery Park where we ate breakfast on Touchstone's dime (fresh fruit! all you can drink lukewarm coffee!) and then sat in on press conference style convos with screenwriter Noah Baumbach, Anjelica Huston, Willem Dafoe, Bill Murray and Wes Anderson. How funny to see our little name alongside the attribution Gothamist.com posted on the press list outside the conference room. More quotes and thoughts on the junket spectacle tomorrow on Gothamist. Perma link now available. Wes and Owen ran into budget problems while making Bottle Rocket until mega-producer James L. Brooks came on board and offered the first time filmmakers and UTA grads what sweet sum of money? PS. The CD you'll receive is not the copy which our silly friend John Walter signed "Love You! Wes" inside just to mock us. That one we keep. Be sure to watch John's new movie, Some Assembly Required, on the Sundance Channel (Dec. 14 @ 9 pm) and Court TV this week, it's about the First Amendment's right to assembly and the cut we saw was super duper good.